Located in central Polk County, Kempton Bridge was originally built in 1959. Over time, it became structurally deficient and functionally obsolete. Flooding in 1993 and an uncontrolled release from the Saylorville reservoir in 2008 damaged the bridge and overtopped the roadway. High traffic volume further added to the need for improvements with approximately 15,000 vehicles passing through the area per day. According to a Des Moines Area MPO traffic model, that number could reach 30,000 by 2030. To provide the needed improvements, the existing two-lane Kempton Bridge is being removed and replaced with a four-lane bridge. 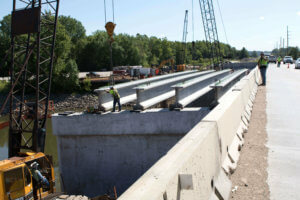 The new bridge will be over 200-feet longer and is designed to better withstand flood events similar to those previously experienced in the area. Additional lanes will accommodate higher traffic volumes, while the addition of multipurpose, recreational trail promotes safe passage for bicyclists and pedestrians. The project involves the reconstruction of two and a half miles of rural, two-lane roadway into a four-lane roadway with a designated left-turn lane. New traffic signals will be added at NW Beaver Drive/NW 66th Avenue and NW 26th Street/NW 66th Avenue intersections. Coordination with utility providers and the United States Army Corps of Engineers (USACE) was performed during design. Several adjustments were made to avoid existing gas main facilities and minimize the impact of relocating overhead electric lines. A 30-inch water main extending from the Des Moines Water Works plant on NW 26th Street west to NW Beaver Drive was directional drilled beneath the Des Moines River. Adjustments were also made to minimize tree clearing and grading on USACE property while maintaining access and minimizing impacts to the Sycamore boat ramp and Neal Smith Trail facilities. 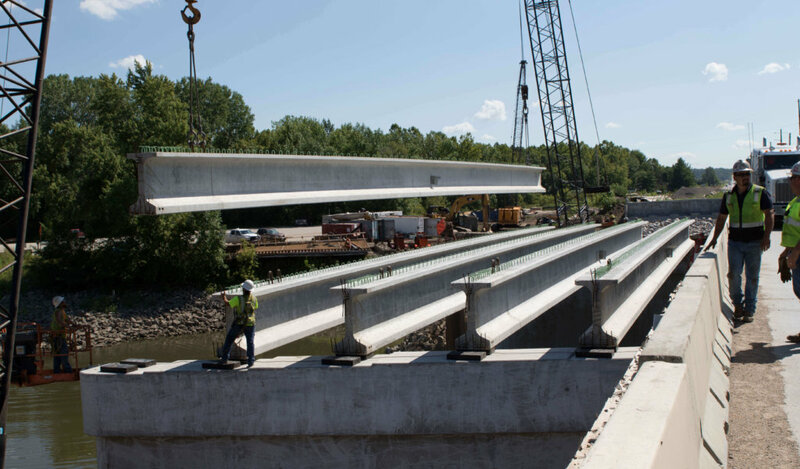 Due to a lack of suitable bypass routes through Des Moines, an extensive three-phase plan is being utilized to maintain two-way traffic during construction. Phase 1: Summer 2015 through Fall 2017. 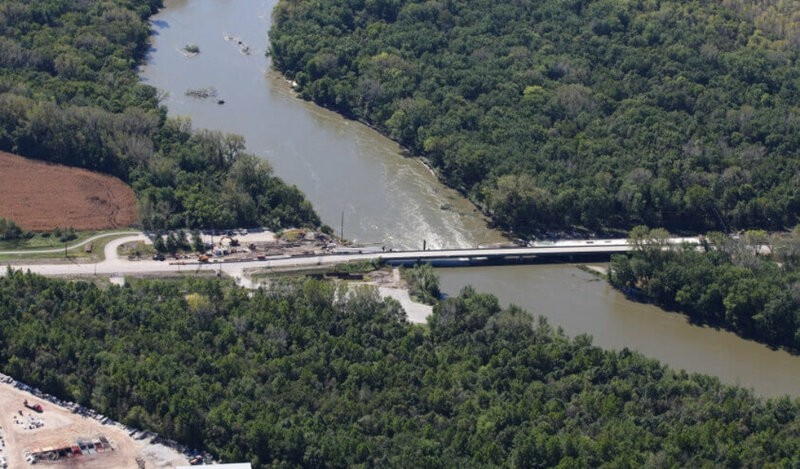 Construction of the new bridge featuring four lanes and a recreational trail along the bridge’s south side to connect with the Neal Smith Trail on the east side of the bridge. Access to the Neal Smith Trail was detoured along Toni Drive via temporary crossings and signals, and waterway traffic was restricted for brief periods. The bridge was constructed in two stages to maintain two-way traffic. Both the bridge and trail opened to traffic in early December 2017. Phase 2: Spring 2017 through Fall 2017. Reconstruction of NW 66th Avenue from the NW Beaver Drive intersection in Johnston to the new Kempton Bridge. NW 66th Avenue was transformed from a rural, two-lane section into a five-lane, urban section with left turn lanes between NW Beaver Drive east past the Johnston Soccer Fields. Reconstruction of NW 66th Avenue also created a four-lane rural section adjacent to the USACE between the Johnston Soccer Fields and Kempton Bridge. The recreational trail from NW Beaver Drive in Johnston to Kempton Bridge will be connected via USACE property. Trail alignment was coordinated with USACE staff to minimize the impact to trees while maneuvering the trail through a wooded area between the soccer fields and Kempton Bridge. Overall project completion is anticipated for mid-November 2017. Phase 3: Spring 2018 through Spring 2019 – Reconstruction of NW 66th Avenue east of Kempton Bridge through the NW 26th Street intersection in Polk County from two lanes to five lanes with a two-way left turn lane. Drainage improvements will eliminate or reduce localized flooding along the roadway. Traffic along NW 26th Street and NW 66th Avenue will be maintained during construction. Snyder & Associates, Inc. is providing a variety of services for the project including traffic studies, environmental, planning, right-of-way, survey, civil and structural engineering. 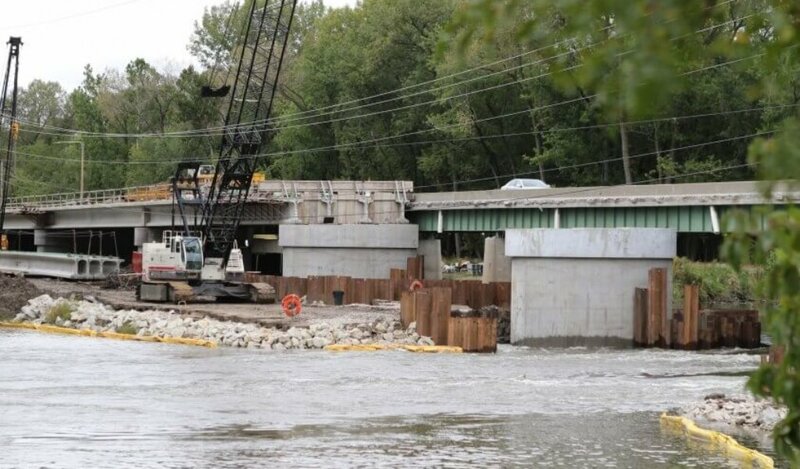 Shuck-Britson provided the bridge design, and Polk County is performing the construction services. Click here to view the environmental assessment.